We have enjoyed some great times at Kestle Barton in 2018 with four varied exhibitions and many other interesting events making up our programme. The season started very early this year with William Arnold’s beautiful photography collection: ‘an “edgelands” homage to Victorian botany’ as he described it. This exhibition took place in our modified gallery space that was specially prepared in advance to host the film by Manon de Boer for the successful first season of Groundwork that was launched in early May. It was wonderful to be a partner in the Groundwork programme, which brought many new visitors to us throughout the whole season. Manon De Boer’s film was very well received and has since gone on to show at Tate, St Ives. This was also our first year to participate in the National Garden Scheme, which has attracted many more garden enthusiasts to us than previously. We were also able to raise some funds for the Cornwall Hospice Care through their Open Gardens initiative. Hamish Fulton made a walk ‘connecting the invisible footsteps’ of the seven previous walks he had made in the south west, from Infracombe to Plymouth, Kynance Cove, St Ives, Land’s End and Penzance. A magnificent wall work was produced for the long gallery wall at Kestle Barton. Hamish came here in late August for an afternoon of conversation with Dr Virginia Button, generously answering many of our questions about the nature of his work. Ben Sanderson also offered a few walking/drawing workshops to compliment the exhibition and provide an opportunity to walk out in the surrounding landscape and be inspired. This year the music improvisers, Tim West, Zoë Martlew and Tony Wood took Spontonality to the AMATA Centre at Penryn Campus, Falmouth University. Dance, theatre and music students enjoyed a jam-packed week, culminating in an amazing Saturday of workshop and performance. Gareth Churcher, in his capacity as Artistic Director of Cornwall Music Service Trust invited Tim and the others to an improvisation session with instrument leads from throughout Cornwall. Spontonality also worked at Helston Community College and revisited the adults at Park View Day Care Centre where everyone always has a ball. The now expected many choruses of Rockin’ All Over the World were not forgotten. It has been a huge privilege, not only to show their recent work from Peer Gallery, but also to be able to host Fourthland & Rosalind Fowler to make new work at Kestle Barton this year. This has proved to be a very rewarding collaboration that has touched the lives of many people – most especially the connections that they established, through the Cornwall Faith Forum, with the Syrian community in Cornwall. 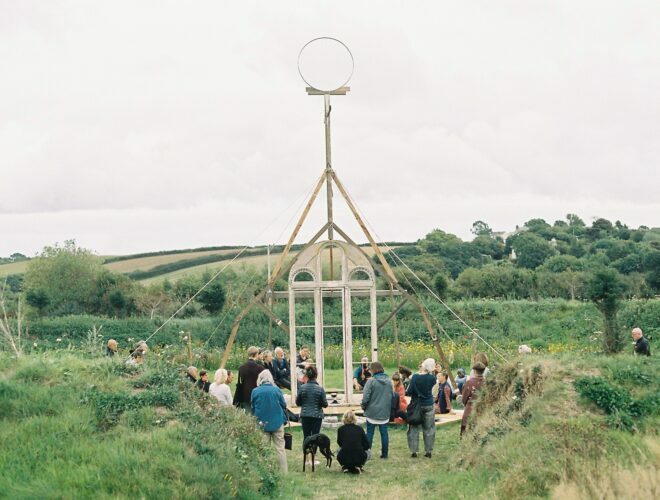 Eight families located throughout Cornwall were able to come together, over repeated visits, to participate in a collaborative sharing of their cultural backgrounds and their creative responses to the artists’ offerings and the Kestle Barton landscape. The artists established further meaningful relations with local craftspeople, residents and students from Helston Community College in collaboration with the National Trust. The final show of 2018 is Fourthland & Rosalind Fowler: BREADROCK, is a culmination of these encounters. This will close on 3 November and we will then remain closed until 13 April 2019 when we re-open for another exciting season. This year’s programme at Kestle Barton was generously supported by the National Lottery through Arts Council England.